Shimmer and sparkle with these classic 3mm round stud earrings. 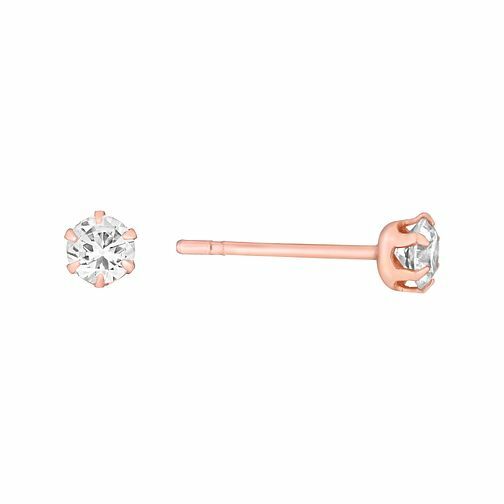 Crafted from luxurious and contemporary 9ct rose gold for a feminine look, these pretty stud earrings are set with a shimmering round cubic zirconia in each stud for sophisticated sparkle. 9ct Rose Gold & Cubic Zirconia 3mm Round Stud Earrings is rated 4.5 out of 5 by 20. Rated 5 out of 5 by Anonymous from Great earrings These earrings are lovely, very sparkly. The quality is excellent I struggle with very sensitive ears to low quality metals and these are perfect. Rated 5 out of 5 by Anonymous from Lovely earrings Lovely, simple earrings. Bought in two different sizes for first and second ear piercings. Very sparkly. Would recommend.